Hanukkah is finally here! To help you celebrate, we’ve rounded up the best family-friendly Hanukkah parties in Middlesex & Monmouth counties. You can eat some latkes, spin your dreidel, snag some sufganiyot (jelly donuts), and light Hanukkah candles at the mall, on ice skates, and even on a trampoline! Join Chabad of the Shore at the Monmouth Mall for a Hanukkah celebration including family entertainment, dreidels, donuts, and the lighting of a giant menorah. Free and open to all. Fun for all ages. Wednesday, December 5, 6 – 7:30 p.m. Celebrate Hanukkah at Pier Village with ice skating, donuts, and latkes. Fun for the whole family. Thursday, December 6, 4 – 5:30 p.m.
A Hanukkah party for children ages 3 – 10 and their parents with age-appropriate crafts, dreidel games, stories, holiday treats, and pizza. 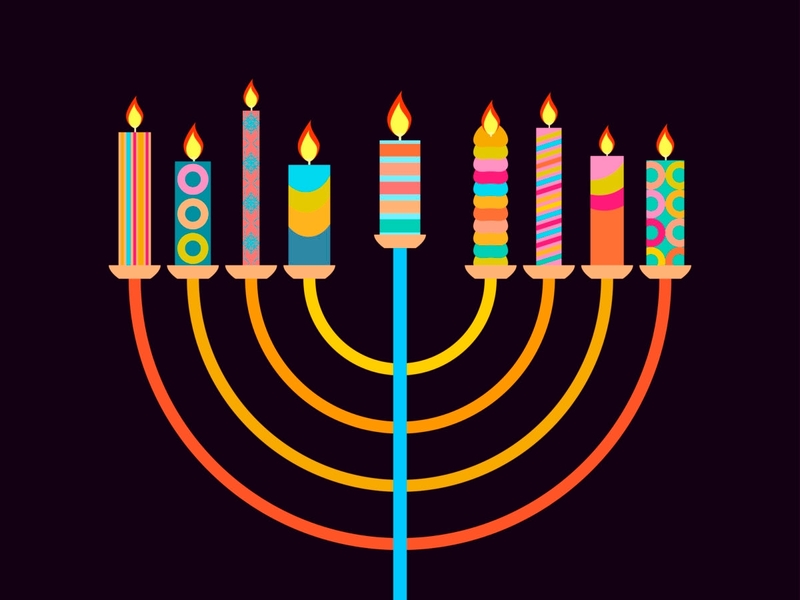 Thursday, December 6, 6 – 8 p.m.
A family-friendly Shabbat service and Hanukkah celebration. Light the candles together, sing holiday songs and enjoy the company of friends. Bring your own menorah and candles. Friday, December 7, 6:30 – 7:30 p.m.
Make your own Hanukkah donut after Shabbat service. All are welcome. Saturday, December 8, Noon – 1 p.m. Celebrate Hanukkah with music, singing, crafts, play time, PJ Library story time, and breakfast. For preschool-aged children and their parents or grandparents. No RSVP required. Free and open to all. Celebrate Hanukkah at the trampoline park with jumping, holiday crafts, and stories. Separate area for toddlers. Free for ages 5 and under. $20/child ages 5 and up. RSVP requested. Sunday, December 9. 9:30 – 11:30 a.m.
Join PJ Library and the Hebrew Academy for singing, snacks, stories, and a special appearance by Mr. Sam. Free and open to the community. Sunday, December 9, 10 – 11 a.m.